The name of this service implies that this is the best help you can get for your academic assignments. Aside from this, the company also promises numerous free features and competitive prices for your papers. The aim of our review is to establish whether these promises are true or false. Cynthia Grimes: For a company that calls itself the best assignment help, I expected much more. I got a good paper, but it was definitely not worth an A or the price I paid for it. 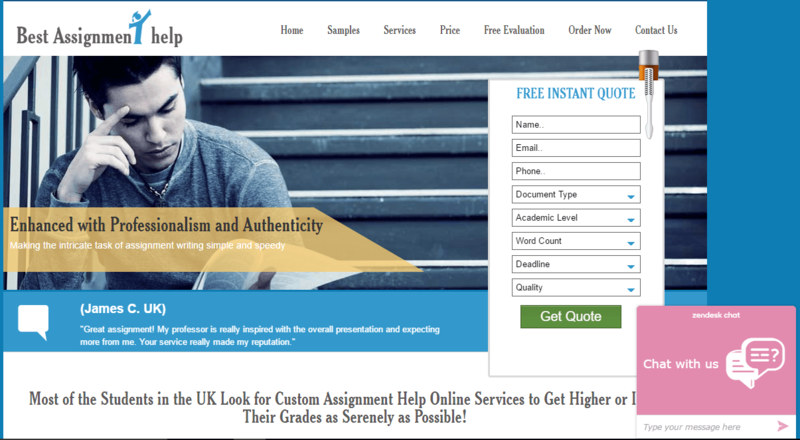 Virginia Blackwell: Ordering from bestassignmenthelp.co.uk was a huge mistake! I got content full of mistakes, probably written by someone who had English as their second language! Additionally, when I asked for a revision, it took the agent half an hour to confirm my request. You would think that a page called ‘Services’ will list the types of papers the company provides, but this is not the case with this company. The only thing we found on the Services page is irrelevant content and no indication of what exactly they provide. If you want to see if the company offers the paper you need, you can only do this in the ordering form. The list on the ordering page is long, which means the company provides the most commonly requested services and more specific ones such as multiple-choice questions, PowerPoint presentations, programming, multimedia projects, simulation reports etc. Prices for papers with a deadline of 10 days and more range from £11.50 to £14.50 per page, while a deadline of 24 hours would cost you £23.50 to £29.50 per page. This indicates that the prices here are affordable and can be considered adequate if the company provides quality content. Bestassignmenthelp.co.uk offers numerous free features such as free bibliography, title page and unlimited revisions. However, we found no indication of any kind of discount, not even a first-order discount. There is an empty field in the ordering section where you can enter a discount code, which is non-existent on the website. We recommend that you contact the customer service for the code prior to making a purchase. We said that the prices this company offers would be suitable for quality content, but this is not the case with this service. What we got after ordering a research paper was content that had no references! Irritated and frustrated, we immediately asked for a revision. What we got was a revised paper delivered two days later, full of unreliable sources that were nowhere to be found in the paper. The customer service also disappointed us. We tried to reach them in order to get a discount code, but no one replied to our request. They finally replied when we got the bad research paper and were extremely rude. We got the revision two days later, which was a day after the original deadline. Aside from the live chat, you can also contact BestAssignmentHelp via phone or email. In conclusion, bestassignmenthelp.co.uk is a valid service, but definitely not one we would recommend. They deliver papers of bad quality and have a horrible customer service that replies occasionally. Even though they promise free revisions, they deliver them days after the request, which is something no student could tolerate.